Pennsylvania (blue) with numbering plan area 717 shown in red. Note that this map is clickable; click on any area code to go to the page for that area code. Area codes 717 and 223 are telephone area codes which serve South Central Pennsylvania and the Susquehanna Valley. They cover the Harrisburg, Lancaster and York metropolitan areas as well as most of the area generally known as Pennsylvania Dutch Country—covering an area of nearly two million people. The main area code, 717, was one of the original area codes established in 1947. It originally covered the eastern half of the state except for the Delaware and Lehigh valleys, which were in area code 215. It stretched from the Maryland border to the south to the New York and New Jersey borders, making it the largest of Pennsylvania's original four plan areas and the second-largest east of the Mississippi River that did not cover an entire state, after Michigan's 616. Despite the presence of five of the state's 15 largest cities (Harrisburg, Lancaster, York, Scranton and Wilkes-Barre), this part of Pennsylvania is not as densely populated as the Delaware and Lehigh Valleys. As a result, 717 remained unchanged for 41 years. For nearly all of this time, it was the largest numbering plan area on the Eastern Seaboard. It was pushed slightly eastward in 1994 as part of the split of Philadelphia's 215, when a few towns in eastern Lancaster County and western Chester County that were slated to transfer to area code 610 were instead shifted to 717. By the mid-1990s, 717 was on the brink of exhaustion due to the proliferation of cell phones, pagers, and fax machines, particularly in Harrisburg, Lancaster, York, and Scranton/Wilkes-Barre. On 5 December 1998, the northern portion of the old 717 territory, centered on Scranton, Wilkes-Barre and Williamsport, received area code 570. As of May 2005, the subscriber number pool of 717 was allocated by 52%. The Pennsylvania Utility Commission determined in 2010 that 717 would likely exhaust by the second quarter of 2018. Under consideration for relief were overlaying 717 with a second area code, or a split along an east-west boundary. An overlay would have required ten-digit dialing, though all customers with an existing 717 number would have been able to keep it. A split would have preserved seven-digit dialing. Most of those who testified in a public hearing supported an overlay as a cost-effective solution that would have spared customers the expense and burden of changing their numbers. In October 2016, an overlay area code, 223, was approved, to become effective in 2017. Since August 26, 2017, 10-digit dialing is mandatory. The 223 area code became available for number assignment as of September 25, 2017. The implementation of 223 broke seven-digit dialing in the eastern half of Pennsylvania. The only portion of the Commonwealth that has not been overlaid to date is 814. 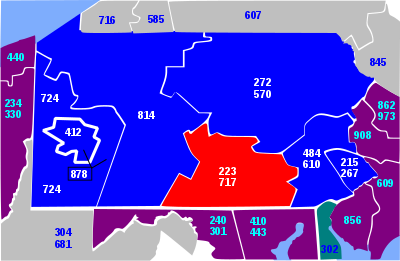 Area code 717 (and 223, starting September 26, 2017) serve parts of sixteen counties in Pennsylvania. ^ "With 717 numbers in limited supply, residents and business owners oppose splitting territory". PennLive.com. August 2016. Retrieved October 16, 2017. ^ "717 area code in Berks, 15 other counties to get 223 overlay". Allentown, PA: WFMZ-TV. November 9, 2016. Retrieved December 7, 2016. ^ "NANPA Planning Letter 501" (PDF). ^ Flyer GT185817PA-HF, Verizon bill enclosure. This page was last edited on 23 October 2018, at 16:43 (UTC).